From the team that brought you the celebrated American Dead comes this powerful drama of race and class relations. 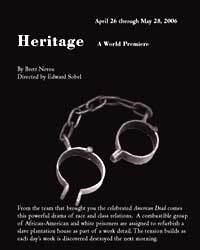 A combustible group of African-American and white prisoners are assigned to refurbish a slave plantation house as part of a work detail. The tension builds as each day's work is discovered destroyed the next morning. "...Neveu makes some strong scratches. The play still needs work -- stakes must rise, the focus needs to settle, the first act feels too thin and things dribble to a close. All can be fixed. On a deep level, this director gets this writer. And you can trust the two of them never to do anything predictable or cheap." "...While the story Neveu unspools is supposed to be contemporary, there is something oddly out of sync about both the manifestation of the racism (as opposed to the fact of it) and the forms of response to it. Too often the play just feels like a melodramatic flashback to the 1950s." "...The play concerns a prison work detail assigned to renovate an old plantation. The deeper the guards and prisoners get into the job, the more the issue of what exactly happened on the slave plantation is the real story. This is theater for active listeners, for people who delight in reading between the lines and figuring out what is really being said and not said." "...Neveu hasn't given his white characters any real stakes in the action, but the conflict between the two black men exposes a kind of inexorable, soul-corroding damage. Under Edward Sobel's direction, Cedric Young as Westfield and Leonard House Jr. as Randy deliver meticulous, thoughtful performances, making their characters' psychic wounds disquietingly real." "...Playgoers are likely to go home convinced that they�ve just seen a poignant docudrama of white guilt and black reparation�or something. And after such a satisfying experience, who cares if they brought most of it themselves?" "...Heritage still might be a draft and a half away from its purest state; some of the first-person monologues have a quick-fix feel, and a few issues of plausibility crop up. And though Sobel�s production gets a little sleepy-eyed rather than bloodshot in what needs to be a volcanic second act, it still sticks to your ribs." "...Chicago playwright Brett Neveu champions the unspoken word, all those pent up feelings and frustrations people can't quite articulate. What we end up watching has none of the trappings of a well-made play (i.e. structure, plot, characterization, all those little niceties). And the subtext can only go so far in creating a watchable evening of theatre."